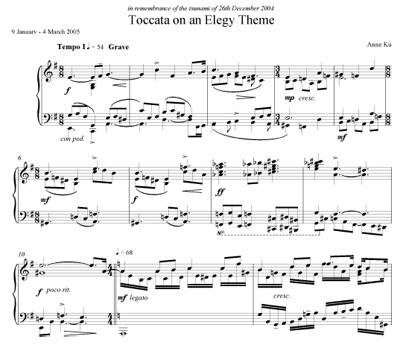 Elwin Hendrijanto premiered “Toccata on an Elegy Theme” written by Anne Ku after the 26 Dec 2004 tsunami that struck Thailand, Indonesia, Sri Lanka, and elsewhere. The tsunami that hit Japan yesterday brought back vivid memories of a winter six years ago in the Netherlands. In the comfort of my home, I read about the unexpected tsunami of 26 December 2004 that nearly destroyed my favourite holiday spot in Thailand. As the tragedy unfolded through the Internet and Dutch radio, I became conscious of how useless and helpless I felt. It was my first year as a composition student at conservatory. I had neither the money nor the means to contribute anything of value. I could not volunteer at the scene. I did not know anyone that was affected. It was before Facebook and Twitter. Yet I felt as though I had lost a dear friend. 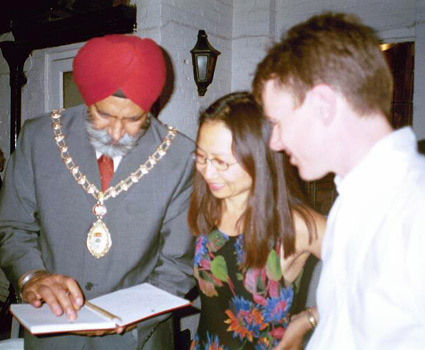 In the end, I expressed myself by composing an elegy to the victims of the tsunami that devastated Southeast Asia. I asked the Indonesian pianist Elwin Hendrijanto to premiere it in Utrecht, Netherlands. His interpretation was so much more powerful than what I expected. It’s like a tsunami — you see it coming but you have no idea how powerful it could get. Listen below. I did run for a fundraising event for the victims of Aceh, but it was working on this piano solo piece and getting my friend to play it that released me. On Friday 11 March 2011, through Facebook, Twitter, and Youtube, I saw what happened in Japan. Such mathematics gives us an appreciation for the beauty of music. When I was studying composition at the conservatory, I learned that mathematics could reduce and ease the decision making required when composing. One of these techniques was deciding on the interval to use. Serial music is an example of a predefined decision rule. Understanding the mathematics of music helps to determine decision rules for composing. When I was 7 and had to learn English for the first time, I regressed to mathematics for comfort. I listened to English through my Chinese ears and the only thing that made sense was to resort to math. “What Chinese animal year were you born in?” I motioned with my hands. Instead of asking my American teachers for their age, I figured it out through the Chinese zodiac system. It was the logic of Modulo 12. 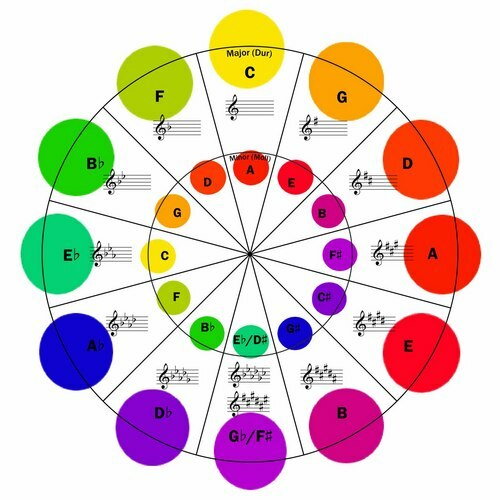 The Circle of Fifths works by the same principle. There are 12 notes in an octave, each corresponding to a key — hence 12 major keys. Each key is related to the next by a perfect 5th interval. Serial music is an example of a predefined decision rule. To learn about twelve tone music composition, I created a spreadsheet to compute the different rows, inversions, etc. I proudly showed it to my teacher. I found a way to use Excel to compose music! I like objectives and constraints to be preset to help bound a problem. 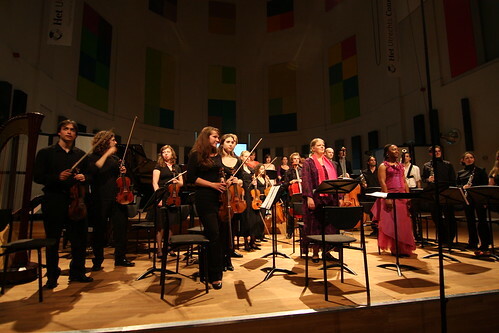 A commission such as “write a piece for my new born baby to reflect the our French and Japanese heritage” is better than “write a piece for my new born baby.” A commission that has a goal and set of criteria or constraints help make the job of a composer much easier. Most of the time, we as performers ask composers to write a piece for piano and guitar with no criteria or constraints. Implicitly we want the composition to be playable, interesting to listen to, and have a longevity beyond the amount of time it takes to write and learn to play it. Every composer has his or her own ideas. They are not always explicit at the outset. Understanding the mathematics of music helps to determine decision rules for composing.